Welcome to my stop on the Hero Arts Holiday Blog Hop! Today we are featuring some of the fabulous products from the 2014 Holiday Catalog and hope to give you lots of inspiration for your holiday card making. This stamp set also has a coordinating die that will help speed up your holiday card making, but I didn't use the die in the traditional way today. I trimmed out the flower and leaves by hand right next to the embossing so there was no border. Then I used the dies to die cut the flower and leaves on a white panel. When the flower is inlaid, you are left with a gap that will allow the color of the card base to show through. So fun! Hero Arts will be giving away one GRAND PRIZE that includes an assortment of stamps, inks, stencils and dies valued at over $75. In addition, two $10 Hero Arts Online Store gift cards will also be awarded. The three prize winners will be randomly selected from all comments received on the participating designers' blogs, so the more comments you leave along the hop, the better your odds of winning! The giveaway closes at 11:59pm PST on Thursday, Oct 2 and the winners will be announced on the Hero Arts blog on Friday, Oct 3. Your next stop on the hop is the sweet and talented Donna Mikasa! If you come across any broken links along the way, you can find all the links to the stops on the hop over on the Hero Arts Blog. LOVE your gorgeous card, Kelly! And what a fun idea, love how you inlaid the flower! Very pretty. Love the colors. Thanks for sharing. Very pretty card. The layering really gave the flower a nice depth. Lovely card! Perfect for the holidays! Beautiful cards - I'm now inspired to get crankin' on my cards for this holiday season! pretty, pretty, pretty poinsettia card. Very beautiful card! Love the way you inlaid the flower. Love the poinsettia! Great card! Love the simplicity of your card. The layering of the petals, great idea. Like the use of the Distress Inks for a wonderful watercolor look. Like the layering. Peaceful Poinsettia is such a beautiful stamp. I love how real it looks on your lovely card. Love this bright puancetia ! Beautiful that combi from classic image and colours and then the mint colour of the card! Just love this card. So pretty. Such a bold design, gorgeous card!!! I really like the way you cut out the flower so the base color could show and frame it. Beautiful. So pretty! I love your poinsettia! beautiful depth on the red in the flower! This card is so beautiful. The dimensions and the coloring of the poinsettia are stunning! Such a simple and elegant card! Gorgeous coloring and great dimension from your cutting technique! I want this stamp. It's so pretty. And the way you have layered the pieces is amazing. Love this stamp! The inlaid technique its beautiful! And the coloring its stunning! Thanks for sharing! THis stamp is just gorgeous and so is your card, Kelly! Thanks for the inspiration. Gorgeous card Kelly!! Love the inlaid technique you've used! Love the inlaid look on this card. Beautiful. What a beautiful card. Just love the Poinsettia and the coloring. Beautiful stamp. Beautiful card. So bright and cherry for the holidays. I think this set is a must have!! The poinsettia is so synonymous with Christmas, and this one is so pretty. Great technique to fussy cut and inlay so the background comes through. TFS!!! Oh so pretty ! this stamp is awesome! Your card is beautiful! Love your inlaid technique, so cool! Beautiful! Clean simple and stunning!!! I love the watercoloring on your lovely card! I love the look you created with the die. This is a stunning stamp! Stunning card! I love the coloring - so beautiful!! Your layered flower is beautiful ! Gorgeous coloring and design, Kelly! The great dimension is lovely for your poinsettia! I love the white background that makes that poinsettia pop - great card! Nice idea and a beautiful card. thanks for sharing. Absolutely fantastic card! Love the 3atercolring and the dimension! Beautiful card with layers for added effect. Very nice. Thanks for sharing. Oh wow Kelly, this is gorgeous! Your card is beautiful. I especially love the way you used the die to inlay the pointsettia. Thanks for sharing. Love the idea of the dimensional poinsettia. Great job on a beautiful card! Thanks for sharing. I love the dimension on this card. Beautiful card - great coloring on the pretty poinsettia. Love the watercoloring you did for this card. I love how the blue background works with those colors! Beautiful card. The dimension of the pointsettia really works on the card, giving it great interest. I love poinsettias. What a pretty card! The white space around the flower really shows it off! Very pretty! Great use of color and dies. Love it! awesome poinsettia! I love the layering! Love how the white outline really pops the red! Love the dimension your card gives and the brilliant red color! I'm a sucker for poinsettias and your card is gorgeous! Such a great idea to use the die like that to let the card's inside color show through. I never would have thought to do that! Love the Peace Poinsettia! What a great idea about trimming the colored image just a tiny bit around the edges, so the card base shows through. Love how clean and fresh your card looks. Nice card with bright colors! Diecutting the poinsettia over that lovely color really makes it pop. Great card. Your card is elegant and gorgeous! I love the water coloring with the distress inks and it's beautiful. The look created by using the die cut as you did is just wonderful and sets off the design so perfectly. Thanks for a great technique idea! Beautiful coloring and CAS design! LOVE!!! Love the card, very pretty. Clever way to inlay the flower. Great statement piece! Thanks for reminding me of all the simple things that can take the card to the next step. Wow! Fabulous! That poinsettia looks VERY realistic and the 3D effect is just stunning! What a stunner! Simply gorgeous!! Great card, your painting is beautiful! Gorgeous card!! Love the idea of hand trimming the flower and then setting it inside the die cut!! The coloring is so pretty and I love how it's kind of framed out from the die! Your card will be a classic. Love the coloring. 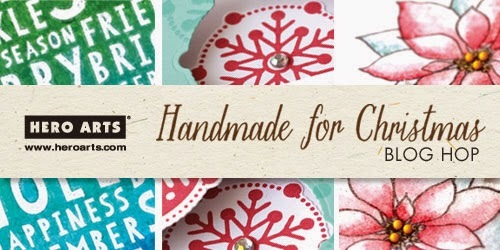 Love the combination of the die and the stamp ~ Poinsettia is beautiful! WOW, such a beautiful card. Love it! Wow...gorgeous! Love your water-coloring on this poinsettia! I adore the dimensions that you added! Stunning card...the colors are so vibrant! Love how you used the die cut! TFS!!! I think poinsettias are the ultimate Christmas image, that is other than the image of the Holy Family. It is so classy. Very pretty card. So gorgeous! Just love this card in every way! Great poinsettia card, love the colors!!! Pretty card thanks for sharing! Pretty card. What a clever technique. Can't wait to try it. A beautiful poinsettia!! Loving this fun blog hop!! I really like how you got the outline around the poinsettia. This is gorgeous! I just got this beautiful stamp set, may have to get the die! My all time favorite flower. I can't seem to have too many poinsettia stamps. Thank you for the inspiration with this pretty card. Your cards is beautiful...great technique! Gorgeous card, Kelly! I love how you die cut the flower so the green can peek through, and your watercoloring is really beautiful! LOVE this card! Stunning! I love poinsettias so this is just beautiful to me!! What a gorgeous watercolored flower, Kelly - just love this!! Beautiful card. I love using distresed inks. Thank you for the chance to win. Love the watercoloring! Thanks for the opportunity to win. Beautiful, love the colors. So simple but festive. I love the use of the non-traditional teal blue card! Beautiful!! I love poinsettias, and your card looks awesome with the inlaid poinsettia! This card is so" Christmas Season "love it. Love how you inlaid the die with a frame window - I can't even describe it, but it's fabulous! Thanks for sharing your creativity, and of course, for the chance to win great prizes!!!! Brilliant use of a die....the flower is spectacular, the card beautiful. I love the layering on the flower! Gorgeous Poinsettia! Love how Hero Arts includes products that are the traditional elements of Christmas and in such good taste. Such a gorgeous card! Love the classic style. Gorgeous stamp. Just received it and anxious to get a chance to play with it. Didn't know there was a die to match when I ordered it. Gotta check my local LSS to see if they have it. LOVE THE COLORS, GORGEOUS CARD. That is a great interpretation of a traditional poinsettia card -- very striking. I. Love. This Card!!!! It is beautiful. Can't wait to create my own. Thanks so much for sharing. Such an awesome 3-D layered look. Gorgeous card! Love how you use the die to make a little border. Beautiful pointsettia!I love the cut away idea and the layers. Absolutely gorgeous, Kelly! Love your coloring of the inlaid poinsettia! Lovely card ... I like the technique of cutting the flower out of the front panel so some of the inside showed through. Thanks for sharing this. Love the card. The Peace Poinsettias clear stamp set is so pretty. Would love to have it. Great poinsettia! You've done a wonderful job. Great card ... the poinsettia is lovely! I love the flower. It really says "Christmas" to me. Great job on the card! Love the way you trimmed the die cuts so that when they were inlaid the color of the base showed through - awesome twist on the standard inlay technique! Love poinsettias! Love your cad! I hate to fussy cut, but it sure made a beautiful card when the die cut flower left just a hint of the card color showing - lots of depth. BTW your coloring is very nice. What a gorgeous poinsettia. Beautiful with all those fantastic layers. Beautiful..love the layering and the use of gold. I love poinsettias and and I love what you' ex done with yours. I would love to see a tutorial video on how you made this card. I love the dimension, and overall design!! Gorgeous card! Wonderful layering and coloring! I'm getting excited to start my Christmas cards! Thanks for the inspiration. Lovely! and adore the inlay style. What an original idea! Love the coloring on the poinsettia too. Must try this. Beautiful! I like your coloring and the inlaid die technique. Beautiful card!!! I really like that poinsettia stamp!! i love having the flower cut out and place inside the die cut! nice to see the colored card stock around it! Beautiful card, I like the card base showing through! I love the technique you used on this card...it gives such nice dimension. Very beautiful card.